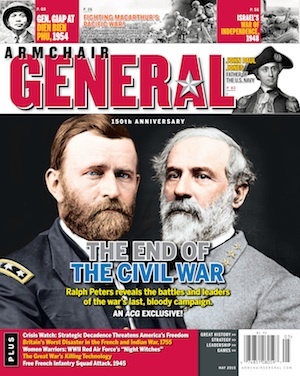 Battle of Waterloo – Summary, Analysis and Assessment for the 200th Anniversary | Armchair General Magazine - We Put YOU in Command! Significance: The Coalition victory at Waterloo proved to be the decisive battle ending the Napoleonic Wars (1803-1815). With his French army defeated at Waterloo, Emperor Napoleon I abdicated and was sent into his final exile on the South Atlantic island of St. Helena where he died from the effects of arsenic poisoning on May 5, 1821. Background: Horrified by the progressive ideals unleashed by the French Revolution, spread throughout the Continent by France’s brilliant leader, Napoleon, Europe’s reactionary kings and princes allied to from a series of Coalitions that waged wars against Napoleon for over a dozen years. In the War of the Sixth Coalition (1812-1814) Britain, Prussia, Austria, Russia, Portugal, Sweden and Spain defeated Napoleon and sent the Emperor into exile on the island of Elba. Napoleon escaped from Elba on February 26, 1815, returned to France and reclaimed his empire in Paris on March 20. Napoleon’s return prompted Britain, Austria, Prussia, Russia, the Netherlands, Sweden, Spain, Portugal and several duchies and principalities to form the Seventh Coalition. The total number of French troops available to Napoleon was 250,000 while Coalition forces would number 850,000 when fully mobilized and moved to the frontiers of France which was expected to be accomplished by July 1. Therefore, in early June, assessing that his greatest immediate threats were the Anglo-Allied army of Wellington and Blücher’s Prussian army, both located in the general vicinity of Brussels, Napoleon led his French Army of the North (120,000) to attack and defeat Wellington and Blücher before the Coalition’s remaining armies could arrive. Prelude: Two days prior to the Battle of Waterloo, Napoleon’s army had won a tactical victory by defeating – but not destroying — Blücher’s Prussian army at Ligny, 25 kilometers southeast of Waterloo. Napoleon dispatched Marshal Emmanuel de Grouchy with 33,000 troops to follow the retreating Prussians while shifting the French army’s axis of advance northwest to attack and defeat Wellington’s Anglo-Allied army at Quatre Bras. Wellington, however, upon learning of Blücher’s defeat – and with no interference by French Marshal Michel Ney’s troops holding Quatre Bras — had already withdrawn his army 15 kilometers north and arrayed it in defensive positions in the vicinity of Waterloo. Wellington’s Position: The Anglo-Allied army’s defensive position was a strong one featuring a 4-kilometer long main line of troops placed along the reverse slope of a low ridge running generally east-west and bisected near the center by the main road leading north to Brussels. Additionally, many of the Anglo-Allied troops were positioned behind a sunken lane that ran for much of the length of the ridge along its crest. In front of Wellington’s main line were three heavily-garrisoned, stone and brick farmstead strongpoints: Hougoumont (west); La Haye Sainte (center); and Papelotte hamlet (east). Hougoumont and Papelotte served as anchors for Wellington’s right and left flanks, respectively, and La Haye Sainte allowed defenders to subject French troops attacking Wellington’s center to a deadly crossfire. Finally, torrential rains that drenched the area throughout the night of June 17-18 favored the defenders since the soggy conditions the downpour produced hindered the mobility of cavalry and infantry and greatly reduced the effects of the superior French artillery – cannonballs plowed harmlessly into the muck instead of bounding across the ground causing casualties. Hougoumont: Recognizing that the fortified farmstead and surrounding grounds of Hougoumont anchored Wellington’s right flank, Napoleon ordered about 12,000 soldiers supported by artillery to attack it. The fighting for control of Hougoumont began around 11:30 a.m. and continued throughout the course of the battle. Yet, despite repeated attacks by French forces, Hougoumont remained in Anglo-Allied hands. First French Infantry Attack: After a French artillery bombardment of Wellington’s center by a Grand Battery of 80 guns, Napoleon sent D’Erlon’s infantry corps to attack the center and left of the Anglo-Allied line at 1:00 p.m. Although D’Erlon’s tightly packed infantry formations gave French attackers the advantage of mass, the formation also allowed little room for maneuver and made the French infantrymen vulnerable to Anglo-Allied musket fire. Additionally, Anglo-Allied soldiers occupying La Haye Sainte – which the French repeatedly tried but failed to capture – caught D’Erlon’s attackers in a deadly crossfire. Anglo-Allied resistance, bolstered by a rash charge by British heavy cavalry, rallied to defeat D’Erlon’s attack. ‘Battle of Waterloo,’ by Thomas Jones Barker. Click to enlarge. French Cavalry Charge: Mistaking the shifting of Anglo-Allied forces and the evacuation of Coalition casualties as the beginning of a general retreat by Wellington’s army, Ney unwisely organized and led a massed French cavalry charge at the Anglo-Allied center at about 4:00 p.m. However, it was unsupported by French infantry and artillery and cavalry alone could not break the formidable British infantry squares Wellington had ordered formed. Ney finally called off the futile cavalry attack and then managed to bring forward French artillery protected by infantry that at last poured a punishing fire on the Anglo-Allied infantry squares. The French seemed on the verge of breaking Wellington’s center (and had finally captured La Haye Sainte), but on the right rear of Napoleon’s eastern flank the first Prussian unit (Friedrich Bülow’s IV Corps) entered the battle and by about 5:30 p.m. began drawing off French forces, relieving the pressure on Wellington’s center. French Imperial Guard Attack: Napoleon still hoped to break Wellington’s center and win the battle before the entire Prussian army could arrive on the battlefield. Therefore, at about 7:00 p.m. he threw his last reserve, the Imperial Guard, led by Ney at Wellington’s center. This final French attack was supported by French troops on its right who had been fighting at Hougoumont and on its left by those of D’Erlon’s units that had been reconstituted after their earlier defeat in the first French infantry attack. The Imperial Guard attack advanced deep into Wellington’s right center and, in fact, had succeeded in breaking the Duke’s line; but several well-timed Anglo-Allied counterattacks, coinciding with the arrival on the eastern flank of the battlefield of Blücher’s Prussian army (between 7:30 p.m. and 8:00 p.m.), repelled the Imperial Guard attack and forced the French into a general retreat. Coalition Counterattack and French Retreat: As the Imperial Guard began its retreat, Wellington ordered a general advance by the Anglo-Allied army which, soon joined by the Prussians, turned the French retreat into a rout. Sometime between 9:00 p.m. and 10:00 p.m. Wellington and Blücher met at La Belle Alliance, Napoleon’s headquarters during the battle, as their victorious forces continued pursuing the defeated French army fleeing south. Strategic and tactical decisions and factors beyond the control of both sides’ commanders led to the Waterloo campaign — and determined its historic outcome. Escape from Elba (February 26, 1815) — There would have been no Battle of Waterloo had Napoleon decided to remain passively in exile on Elba. With King Louis XVIII on the French throne, however, the restored aristocracy resumed their pre-Revolution oppression, and the overwhelming majority of Frenchmen desired the Emperor’s return. Napoleon considered it his imperial duty to fulfill his countrymen’s expectations and end foreign interference in France’s internal affairs. Return to Paris – Napoleon’s triumphal return to Paris without a single musket being fired confirmed the good sense of his decision. Louis fled and Napoleon offered peace and constitutional reform to Europe’s monarchies – they responded by declaring him an outlaw. With war again forced upon him, Napoleon chose to lead France’s army to resist the coming onslaught. Defeat the Coalition “in Detail” – England, Russia, Austria and Prussia (and smaller nations) formed the Seventh Anti-Napoleon Coalition and began mobilizing to attack France. Yet, history’s greatest military strategist would not sit idly by while his enemies leisurely massed their forces. Napoleon decided to seize the initiative, strike north toward Brussels, and defeat the most dangerous immediate threat — Anglo-Allied and Prussian armies — “in detail” (destroy a portion of the enemy force before it could fully mass against him.) Using the strategy of “the central position” that had served him well in all his wars, Napoleon intended to place his army between two enemy armies, and while holding one at bay, defeat the other before turning on the former. Tactical Decisions and Factors: Once the armies met on the battlefield, tactical decisions – and the bad luck of torrential rain — determined the Waterloo campaign’s outcome. Missed Opportunity at Ligny – Napoleon chose to target Blücher’s Prussians at Ligny by placing his French army between the Prussians and Wellington, a brilliant tactical move that, had it totally crushed the Prussian army, would have won the war. He fixed them in place with part of his force, expecting Marshal Ney to move his troops from Quatre Bras and take the Prussians in the rear. Although Napoleon defeated Blücher’s Prussians, he did not crush them – an apathetic Ney failed to appear and a thunderstorm hindered French pursuit. Instead of winning the war at Ligny, Napoleon had to repeat his “defeat in detail” strategy, this time against Wellington’s Anglo-Allied army at Waterloo. Waterloo’s Delayed Beginning – Heavy rains fatefully intruded again on tactical plans, soaking the Waterloo battlefield the night of June 17-18, and preventing movement of artillery to support a massive attack. Napoleon delayed military operations until the ground had dried somewhat – several critical hours allowing Wellington to perfect his defenses while giving Blücher’s Prussians time to arrive just in time to tip the battle in the Coalition’s favor. Ney’s Tactical Blunder – “Bravest of the brave” Ney followed his June 16 failure at Quatre Bras-Ligny by committing another egregious tactical blunder about 4:00 p.m. June 18. Ney’s foolishly unsupported massed cavalry charge against Wellington’s well-sited infantry squares robbed Napoleon of the critical combat power he needed later to seal a victory before the Prussians arrived. Although Napoleon’s Imperial Guard attack in fact cracked Wellington’s line about 7:30 p.m.-8:00 p.m., Blücher’s arrival unbalanced French tactical dispositions, reversing the battle’s outcome. Grouchy’s Double Failures – Marshal Grouchy, sent with one-third of Napoleon’s army to pursue the beaten Prussians after Ligny, could have ensured Napoleon’s Waterloo victory had he accomplished one of two tasks: prevent Blücher linking up with Wellington; or “move to the sound of the guns” and join Napoleon at Waterloo. He did neither. When large numbers of troops began approaching Waterloo from the east around 7:30 p.m., Napoleon was horrified – and Wellington greatly relieved – to discover they were Blücher’s Prussians, not Grouchy’s French. The Prussians saved Wellington, snatching allied victory from the jaws of defeat. Jerry D. Morelock, PhD, HISTORYNET Editor at Large. For additional information see ‘Napoleonic’ Warfare—Its Strategy and Tactics; Napoleon Versus Wellington; and Recommended Books on the Battle of Waterloo. The background section fails to mention that Bonaparte proved those reactionary kings and princes correct. He was a progressive leader who became a despot when he crowned himself emperor. Wasn’t it because Ney was held at Quattre-Bras that he failed to pursue the Anglo Allied army in its retreat from Quattre-Bras to Waterloo? what factors of waterloo made it decisive for various wars? I mean climatic or geographical etc. Nice little piece, however the Prussians didn’t arrive at 7.30pm unless its in reference to the final attack. The Prussians were operating on the periphery from around 2pm and were making a direct impact on the battle by 4pm. Wellington wanted everyone to think they arrived just in the nick of time and that he had done all of the hard fighting, in reality the Prussians had a far greater contribution than was ever acknowledged.